But in the meantime, how fabulous is this horse? 20 consecutive races, 20 consecutive wins. Yesterday's newspaper was full of stories and pictures of her. Now if I was a gambling type, I might consider putting money on Black Caviar in her next race. But the odds don't look too inviting, the paper says I'd have to put down $100 just to win $5, not a good deal in my opinion. Luckily I'm not the gambling type, except for Lotto mega-draws. but when it comes to winning money.......I'm a loser. This post is to show you the pictures I photographed from the front pages of the paper. Don't tell me horses don't smile! Black Caviar on the left, unknown horse on the right. Here she is getting a well-earned drink and splash down. Look at that smile! This has to be the happiest horse I've ever seen. Time to post photos that have been languishing in your files. Bring them out and let them shine! Sunday Selections is brought to us by Kim, of Frog Ponds Rock, who wanted to share some of the older photos of the many thousands that she takes. I thought it was a great idea, so I jumped on board, as have quite a few others. I often choose a theme for my photos and this week I bring you the only cat in the flats that hasn't immediately run away from me. I turned onto this path just as she was coming along it, so I stopped to see if she would come to me. returning to the irises, staying just out of reach, only occasionally looking straight at me. she has such pretty markings, and tufted ears, reminding me a little of a lynx. For more fruit of course. apples and bananas this time...so of course I needed the bigger bowl. Luckily I'd just washed the dust out of it. ....but autumn is finally here in Adelaide. Skies that were still light at 8pm a month ago, are now dark at 6.30pm. Mornings are chilly, nights that were comfortably cool for sleeping are now becoming cold. Dressing gowns are being brought out of hibernation, slippers are being dusted off, fleecy tops are being washed ready to wear. And the trees are finally changing their clothes. After wearing nothing but green for the past six months we now see them in greens and golds, greens and bronze, greens and browns, golds and reds. Here are a few photos taken in my street last Sunday. I love this red/orange shade. footpaths are carpeted in colour. fences are edged with crisp dry leaves that have a sweet tea fragrance. sadly, this fragrance doesn't last long, once the leaves have been rained on a few times the sweet smell is gone. which was presented to me by The Elephant's Child, thank you so much EC. I've had awards in the past and frequently forget to acknowledge them here on the blog, although I do usually thank the presenter in their comment sections, or by email. 4. Present the award to 5 bloggers who have a following 200 or less, who you feel deserve it. 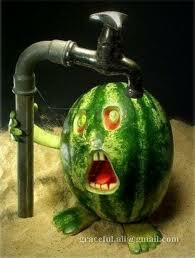 Whimsical Wednesday is your weekly dose of giggles, brought to you by googled images, via Drifting Through Life. Today is ANZAC day here in Australia, and there may be a few sad thoughts around, so I'm hoping to spread at least a little cheer here. So that's how the water gets in! Way back in those "Days of Yore", young women learned at any early age how to screw up their noses, squint their little eyes, and stab their little fingers, while stitching away laboriously at cotton or linen items for their "Hope Chest". Antimacassars, doilies, table napkins, silk handkerchiefs, nightgowns, all were hemmed by hand and embroidered, some daintily, others heavily covered in hand stitched designs, then packed away in a large trunk or chest or some other kind of cabinet, waiting for the day when these girls would marry and use these lovingly (?) prepared items in their own homes. I had never given any thought to getting married, certainly not to collecting stuff to furnish a home, but when I was sixteen I went to live with my mother, whose one mission in life seemed to be getting me safely married off. I own a few (dozen) movies on DVD and I have a typed list of them in a folder in a drawer somewhere. I'm often disappointed and decide to watch a DVD instead. Like the Big Bang Theory, Criminal Minds and Bones. Along with the movies I've collected. But even then, sometimes I can't decide. So I get out the list, shuffle the pages with my eyes closed and randomly stab at a title. Yesterday afternoon, I watched Robin Hood - Men In Tights. Time to post photos that have been languishing away in your files, photos that you may have forgotten about. This concept comes to us via Kim of Frog Ponds Rock fame and it's been going for over a year now! The rules are easy, just post your photos on a Sunday, link back to Kim somewhere in your post. then head on over to Frog Ponds Rock and add your name to the linky list before leaving Kim a comment. While you're there have a look at what others have posted for their selections. This week I bring you a few more beach photos. This is BILL, a miniature steam train that runs paying passengers between the Semaphore Foreshore and Fort Glanville Conservation Park at Semaphore Park during the summer months. Once he gets to Fort Glanville there is a short break while the train is turned around for the reverse trip and passengers are allowed to get off and stretch their legs. The awning! She is up! My lovely striped awning was installed yesterday morning. A phone call began the process with a lovely voice stating that his name was Nick and he'd be there in about forty minutes. He arrived right on time, that's a good sign. He wasted no time, getting started immediately and the work was done surprisingly quickly. In no time at all, the awning was up and Nick was showing me how to work it. Then he filled out the paperwork, I paid him, he handed me the warranty and was gone. This is my front window with the "eyelash" awning, you can see it does nothing at all to shade the window and the amount of heat that gets in is far too much. The new canvas awning fits neatly under the eyelash, the boys who did the measuring were spot on. I chose a scalloped edge because all the other awnings have it too, but I chose stripes instead of plain, because now, I stand out as an individual. My curtains have been up since last Sunday and I'm very happy to have them there, but the job isn't finished just yet. They've been folded up and stashed in a corner of the wardrobe since I moved here eight months ago and now that they're up I realise they've collected quite a bit of dust. This is not at all good for my hayfever/asthma, so when the awning is finally up on Friday, I'll be taking the curtains down and giving them a good wash. The weather is supposed to be cooler on Friday, so the awning should take care of any heat trying to get in my window. My Semaphore window was closer to 4 metres wide and the Maylands one was 3 metres and floor length. I don't spend my days asking "why am I here?" I don't do a lot of soul searching for the reason I was placed here on this earth at this time. I am here to enjoy my years in this life and to give birth to my four children, two of whom have now had their own children and the world is a better place for it. I certainly don't spend hours/days/months gazing at my navel* contemplating the meaning of life. There is no meaning, life just is. Instead, I read books that draw me into the story so deeply I feel as if I'm there, I also read books that make me laugh. Here's a few passages that I hope will make you laugh too. "Sunday was jelly doughnut day. It was like taking communion. I'm a Catholic by birth, but in my own personal religion, the Trinity will forever be the Father, the Son and the Holy Jelly Doughnut." Time for the weekly googled image giggle to help you get through the week. 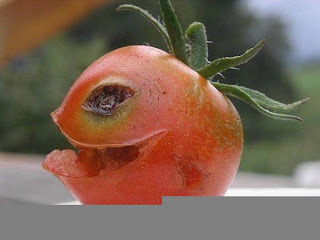 This must be the happiest tomato I've ever seen. We all know I've been waiting to have an awning installed on my front window...well, I got fed up with waiting and called the company and asked how much longer I might have to wait? They had said about three weeks and it's been much longer. (About two months so far). The awning is being installed next Friday. Yay!! Meanwhile, the sun coming in through the front window has been making the lounge room very warm, even with keeping the blind drawn down. And at this time of year I've been noticing the cold coming in at night too. So when my son-in-law and grandson arrived on Sunday to install my curtain rods I was very glad to see them! Anyway, they arrived with the big toolbox and the new cordless drill and set to work. The lounge room rod went up first and I got my old thermal lined curtains out of storage (stuffed into a corner of the wardrobe) and put them up, drawing them closed to shut out the sun. My friend Delores is taking part in the April A-Z blogging challenge and she has chosen foods that she and her husband are able to eat. They are both on restricted diets, so finding foods from A-Z is quite a challenge! I'm very curious about the letter X! For B, Delores posted the recipe for her Banana Walnut Loaf. Now I'm a big fan of bananas and I love walnuts too, so I wrote down her recipe and gave it a try last Saturday. For me, this was a challenge in itself, since this loaf has honey instead of sugar and oil instead of butter. Very different from my usual style. But it turned out very well. So I'm sharing this recipe now with you, I know Delores won't mind at all. half a cup of chopped walnuts. Time to post old photos that have been languishing in your files, photos that you may have completely forgotten about. This idea was brought to us by Kim of Frog Ponds Rock who realised that she takes many, many photos that never see the light of day and wanted to share them with us. To join in with us, just post your photos, (new or old, doesn't really matter), under the SundaySelections title, link back to Kim and add your name to the linky list at her site, before leaving her a comment. It's not necessary to do a theme with your photos, although I often do. This week I have a mixed bag of stuff taken while wandering around Semaphore a few weeks ago. do you know what I wish I had?